There are books for children who need fluffy chickens and cuddly bears at certain times in their lives - and there are books for children who need to fill their imagination. 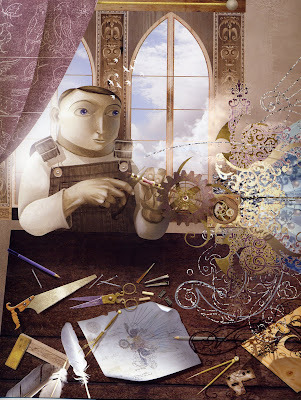 If you want to be visually transported into a dream world that stays with you long after the book is closed, and if you admire the work of Peter Sis and Shaun Tan, then rush out immediately and buy FArTHER. 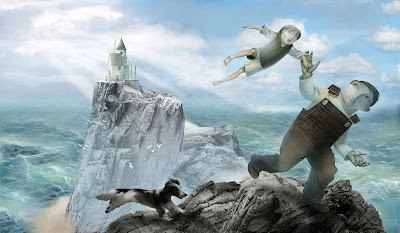 It will awaken your dreams and those of the child who shares the story with you. FArTHER with its incredible endpapers that could have leapt from Leonardo's notebooks, and its illustrations that have me rubbing the pages to make sure they're not real pencil, ink and paper collage, is a triumph not just for Grahame Baker Smith but also for Templar Publishing. 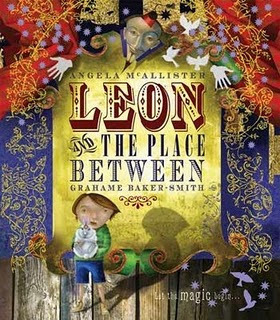 I first notcied Grahame Baker Smith's work when Leon and the Place Between, written by Angela McAllister, and also published by Templar, was shortlisted last year for the Kate Greenaway. Who can resist a magic show with pure magic in the illustrations? But in FArTHER we have a story that bores deeper into our inner psyche. 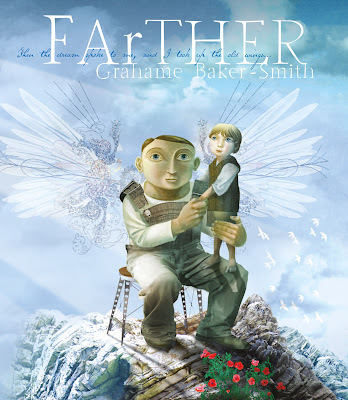 Slightly dark with its themes of death and hope and renewal, which might seem heavy in a picture book, but not in the hands of Grahame Baker Smith, where a father who dreams of flying goes off to war, never to return, but instills in his son the courage to soar. Don't we all want our children to soar? Each page is filled with detail that demands another inspection. Strange symbols tease - the bright red poppies against the rocks - the white goose standing at the feet of the father while he despairs of ever flying - the eyes that convey the dream. 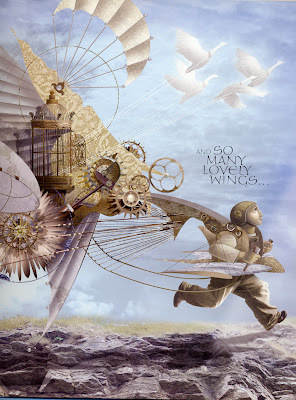 The contraptions that he imagines and builds are beautiful machines with delicately spiralling cogs, gilded cages and fluted and folded wings that appear more like paper origami, or finely beaten foil with spines that suggest ancient fishing rods. Mechanical yet strangely organic, bringing to mind the contraptions built by the Wright brothers in that lonely shed on Kitty Hawk Beach in North Carolina some hundred years ago. Perhaps I'm beguiled by the adolescent boy climbing the tree to stare out at the world. My teenage son used to climb a gigantic pin oak. I'd come out and find him in the topmost branches at a death-defying height standing still and silent. What was he imagining? And what does the boy in the story imagine? But however much we are beguiled by the illustrations, we haven't been tricked. It's not the medium that tells the story. It's the story that tells us. It's a big story but a convincing one. And Grahame Baker Smith engages the reader in his fictional world because he himself is engaged in the real world. He underpins the story with a truly human sense of desire, hope, fragility and loss. And what an imagination! FArTHER surprises and enthrals. Give this book to all fathers of sons and to all children who dream and need their imagination filled - and even to those who don't - because afterwards they will. Lovely post. This book sounds like a must. Oh wow, this book looks and sounds magical! HAVE to have it. An amazing post, thankyou! What's great about this post is the quality of the writing and the way you transmit the powerful feelings evoked by this wonderful book. Thank you. More please! My children (think they) are too old for picture books, but I MUST have this. I will give it to them when they grow into them again. Gillian I've just given it to my son, whose son was born 6 days ago. I'm hoping he has grown into picture books again as he'll certainly be reading plenty of them in the future!